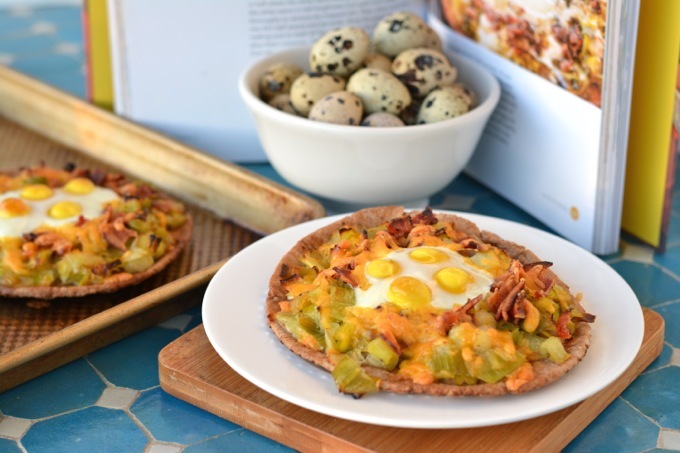 These Leek and Bacon Breakfast Pizzas bring together soft, melt-in-your mouth leeks, crispy bacon, velvety egg yolks and crisp whole-grain pitas. These are perfect as breakfast-for-dinner, too! FRIENDS! I am so excited about today’s post. Not only do I have a super amazing recipe to share with you today, but I also have an amazing new cookbook to share with you too. Sometime shortly after Nick and I started gardening seriously, I stumbled upon the blog Garden Betty. I know I’ve mentioned it on here before, and I mention it again because it is truly one of my favorite blogs. The blog’s author, Linda, writes mainly about gardening, cooking, and traveling (especially in California)… three of my favorite topics! Her photos are gorgeous and her blog is such a great resource. The day I discovered Garden Betty I think I literally spent 3 hours reading every archived post. I love reading about the different heirloom vegetable varieties and unique plants that Linda grows, her creative uses for plant parts that we typically throw away (like carrot tops), and her adventures and exploration of some really cool off-the-beaten-path parts of California. She’s been such an inspiration and I’ve gone from buying generic seeds at Lowes to seeking out rarer varieties online from companies that truly care about sustainable food (like purple potatoes, candy cane beets, heirloom tomatoes and long, skinny French breakfast radishes). I love having access to unique veggies I can’t always buy at the grocery store. When Linda announced that she was writing a cookbook, I was beyond excited. When she chose me, little old me, to review a copy of her book, I was ecstatic. I’ll be honest, with blogs and Pinterest and the internet, I don’t look at cookbooks nearly as much as I used to. But the day that The CSA Cookbook arrived in the mail was like Christmas morning. I was SO excited! This book is so much more than a cookbook. Linda pours her heart and soul into this book, and just by reading the intro to the book and the history behind each recipe, you’ll feel like you know her. The CSA Cookbook is all about using up all the strange things that show up in your CSA box, at your farmer’s market, or if you’re lucky enough, in your backyard garden. CSA stands for community-supported agriculture, and is basically a locally grown produce subscription service. The idea is that the pool of subscribers’ money supports a local farm (or farms), and subscribers share in the harvests from the farm. Since we have so many veggies from our own garden, we don’t participate in any CSA’s, though there are tons around our area and I would absolutely love to if we didn’t have the time to grow our own produce. But many of the things we are growing in our garden are the same things that local farms and CSA’s are growing. Linda grew up in an Asian household where food was not wasted. Many Americans, in a society that is so indulgent and wasteful, don’t realize that there are so many parts of plants and veggies that you can eat. Things you would throw away. Things you don’t even find in the supermarket because the mass-producers throw them away before they even get there. For example, how often do you buy carrots in bags versus a fresh bunch of carrots with the tops still attached? My guess is pretty often. I loved reading through Linda’s book (and I read through every single page) because I learned SO much! I definitely use as much of our plants as possible. We always eat radish tops, beet greens and broccoli leaves. But there are so many other things you can eat that I had NO IDEA about. Tomato leaves, pepper leaves, kale buds (which is especially good to know since my 10 million kale plants are all bolting and flowering right now). I’m so excited to try so many of Linda’s recipes. They’re all so fresh and simple, and really capture the flavors of the seasons. The photography in Linda’s book is also amazing. Nothing turns me off from a cookbook more than pages and pages of recipes without a single photo. Not the case here. Not only does The CSA Cookbook have a photo of every recipe, it has absolutely beautiful photos with every recipe. I like to see how my food is supposed to turn out! (Whether or not it does turn out that way is another story!) Linda’s photos had me drooling over each page. I almost tried a kale recipe first, but I thought that would be too predictable. I was especially intrigued by the Kale Stem Pesto since, I admit, my kale stems almost always head to the compost bin. After pulling myself away from the kale section, I settled on the Leek and Bacon Breakfast Pizzas. Leeks are such a great spring vegetable, and though I didn’t grow them this year, I had a major craving for them and picked up some really nice looking ones at Whole Foods. As I’ve said before, I feel like spring veggies are fleeting, so I had to take advantage of this recipe while I had the chance. Since we always have so many quail eggs, I decided to use those instead of chicken eggs. The original recipe calls for Monterey jack cheese but I couldn’t find a good quality one where I went shopping, so I used cheddar. Everything else I pretty much followed to a T.
Trim the root ends off the leeks and cut the leeks in half where the white stems and green leaves meet. Slice the white part in half lengthwise, then slice crosswise into thin half moons. Place cut leeks in a bowl of cold water and swish around to remove dirt between all the layers. Drain and set aside. Repeat with greens. Heat a large skillet over high heat. Cook bacon until crispy, then remove from skillet and drain on paper towels, leaving the bacon grease in the skillet. Reduce heat to medium. Add the green leeks to the skillet and cook until starting to wilt, about 5 minutes. Add the white leeks and cook for 5 more minutes, stirring occasionally, until the whites are translucent and the leeks are soft. Place the pitas on a baking sheet (or two if they don't all fit on one), and brush them generously with olive oil. Chop the bacon, then top each pita evenly with leeks, bacon and cheese. Make a small well in the center of each pita and crack an egg into it. Bake until egg whites are set and yolks are still slightly runny, about 10 to 12 minutes. Serve topped with a little fresh cracked pepper. There is something to be said about simple recipes with good, quality ingredients. This was one of the best meals I’ve made in a long time and I think we were yumming and groaning in delight after every single bite. The leeks were so soft and melted in your mouth, so good with the crisp bacon. Though my egg yolks weren’t super runny (because of the size and ratio of white to yolk, it’s pretty much impossible to get quail yolks runny while fully cooking the whites) they were a perfect soft-boiled texture. Silky and smooth. I already want to make these again, and I’m definitely planning to plant some leeks next year. This recipe is from The CSA Cookbook, click here to find out more about the book! Disclaimer: I was sent a complimentary copy of The CSA Cookbook to review. I was not compensated in any other way. All opinions are my own. Harvest Fridays - Root, root, roots! « Harvest Fridays – Where are our fish!? This sounds heavenly! I have only ever made a breakfast pizza once before, but I absolutely loved it. And that cookbook looks amazing! What a great breakfast idea! I’d skip the bacon and gobble up all the rest of it. Haha! I’ve been wanting to get more eggs in my diet in the morning. It was SOOO good! If you skip the bacon, you might use a saltier cheese like feta. It really is a gorgeous cookbook… lots of veg friendly recipes too! Yes, they are homegrown! We’d really love to have chickens but our yard just isn’t big enough (especially since I’m a neat freak). The quails are much more manageable (and since our house is practically on top of our neighbors, a little quieter, too). They’re really fun… the only time I miss chicken eggs is when I want a nice poached runny yolk! It was an amazing recipe, thanks! Oh I love these pizzas, Jess! Breakfast pizzas are one of my favorites but I’ve never made them myself before! I love the flavors in here. And such gorgeous pictures, too! They’re SO good… and so EASY too, since the “dough” is just a pita! You turned me on to Garden Betty and I am obsessed! Love learning from all of her knowledge! I must have this cookbook. That breakfast pizza sounds delicious. And could your quail eggs be any cuter?!? Yes, you need it!! Especially once your garden starts producing! I’m seriously amazed by all the parts of different veggie plants you can actually eat! 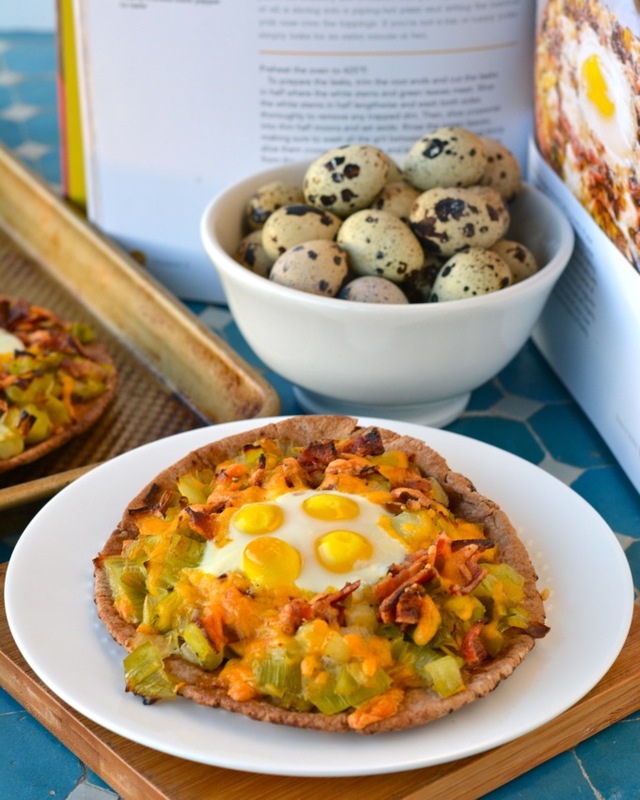 Breakfast pizzas are amazing! These look divine and so good, Jess! Jess I need these in my life asap!! Mouth watering good! !